As a young boy in the 1990s, Sophea Chhin witnessed a lot of birds being slaughtered for food in his community. It was this experience that sparked an interest in wildlife research within him. Poverty did not deter Mr. Chhin from pursuing his dream of becoming a biodiversity expert. He studied Biology at the Royal University of Phnom Penh, then pursued a degree in Management Information System at SETEC University. With his love for biodiversity, he completed his Masters degree in Biodiversity Conservation. Today, he is a PhD candidate of Ecological Conservation at King Monkut’s University of Technology Thonburi in Bangkok, Thailand. He has also trained nationally and internationally in taxonomy, curatorship, museum management, wildlife techniques, data analysis, and paper writing. At 34, Mr. Chhin already has contributed significantly to wildlife research and education in Cambodia. He is one of the founders of Birds of Cambodia Education and Conservation, a program that encourages young Cambodian photographers to take photos of birds and other wildlife and share them so that people may learn about various species via social media, schools, and other platforms. All wildlife images taken are also going to be compiled as scientific books to be distributed to libraries in Cambodia. Through the Birds of Cambodia Education and Conservation program, Mr. Chhin promotes the photography of birds and other wildlife in protected areas. He is now working on the book “The Birds of Cambodia: Annotated Checklist,” which features photos taken by various enthusiasts. The group also holds exhibits of images of vulnerable and critically endangered birds in primary, secondary, high schools and universities so that students may get to know the birds and understand the need to conserve them. Prior to exhibitions, Mr. Chhin and his team conducts baseline survey of the students’ knowledge level. After the exhibit, he conducts an impact evaluation to find out whether there is any significant improvement in the students’ knowledge of birds. He and his group also designs posters containing information on birds and distributes them in local communities. The idea behind the campaign is to highlight the significance of bird to humans and urge the locals to protect them. He also leads bird watching activities to inspire students and communities to love birds. As a government official at Cambodia’s Ministry of Environment, Mr. Chhin plays a key role in the Research and Biodiversity & Ecosystem Assessment Office, a core component of the Department of Biodiversity. In the Ministry, he conducts biodiversity research and gathers all biodiversity information from relevant biodiversity conservation groups in Cambodia. He compiles the data for the National Biodiversity Action Plan. So far, he has described several species which are not just new country records, but also new to science. In addition to conducting biodiversity research, Mr. Chhin also facilitates cooperation between Cambodia and Costa Rica to initiate a policy on Payment for Ecosystem Services (PES). Also known as payments for environmental services (or benefits), PES are incentives offered to farmers or landowners in exchange for managing their land to provide some sort of ecological service. The young conservationist is also a passionate teacher who brings his students to forests to help them have a sense of oneness with nature, spark an interest in wildlife research, and cultivate a culture of stewardship. Teaching biology at the Royal University of Phnom Penh, he shares with students his knowledge on Ecological Field Techniques. Apart from teaching theory in the classroom, Mr. Chhin brings his students to practice the field course in the forest. Students credit him for taking away their fear of the forest. His passion for forest and wildlife has inspired them to have a better appreciation of the forest and the species that live there. The young teacher also continues his quest for more knowledge. 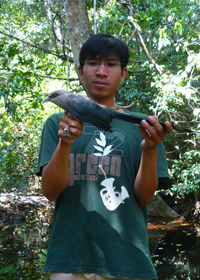 For his PhD studies, he is focusing on the conservation ecology of Cardamom Mountains’ endemic bird species. Very little or no research has been in this area owing to the mountains’ difficult terrain.